Seriously dedicated to Skin Education & results! We’re more than just a beauty salon, we specialise in analysing your skin and prescribing the best solution for your individual requirements. We achieve great results because we have the very latest in diagnostic skin scanning equipment, superbly trained and experienced staff, a complete range of the most modern equipment available to the industry and a selection of salon exclusive products for use in your treatments and as a part of your home care program. You can be assured of results! 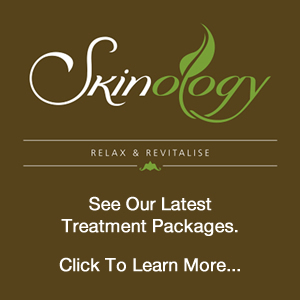 You can expect that a full diagnostic skin evaluation and skin care report is a vital part of all facial treatments at Skinology. Because each of our specialised facial treatments are individualised according to your specific needs, our pricing structure is determined by the length of your treatment, the specialisation of the products used and the selection of equipment used in your treatment. All of the agreed upon procedures and their charges will be explained to you prior to your treatment commencing, so you are fully aware of the treatment procedure, the benefits and all costs.